The iPad accessories you need to get the best from your tablet. To get the best from your tablet, you'll need the best iPad accessories. From portable keyboards and stands to turn your device into a serious workstation, to cases to protect your tablet and keep it clean, to speakers and headphones, there are plenty of iPad accessories that can improve your user experience. In this guide, we've picked the best iPad accessories from a range of different categories. Use the quick links to jump to the section you're looking for. With all the work done, all you need to do is decide which iPad accessory will get you the best out of your iPad this year. Not got an iPad yet, or looking to upgrade? Here are the best iPad deals right now. Being the official Apple stylus, the Apple Pencil (2nd gen) is near perfect for the job. It magnetically attaches to the iPad Pro and charges wirelessly while there. The Pencil features a double-tap sensor that allows you to switch pen styles easily. It's also both pressure and tilt sensitive so can be used more like a real pen. You can increase pressure for thicker lines or tilt for shading, all while leaning your hand on the screen without marking your work. 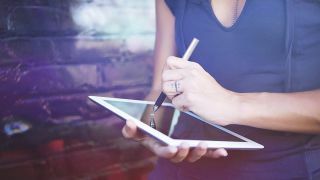 The Adonit Jot Pro is a great choice if you want to save some money without sacrificing on style (this bargain stylus looks good even when paired with the design perfection that is Apple's iPad). A magnetic core allows this to clip to your iPad while the precision head with clear plastic jot dot offers for super levels of accuracy – you can see exactly what you're pressing against. Of course, at this price, you sacrifice all the smart extras like pressure sensitivity and tilt support. This is a super-budget stylus that works on all iPad devices. The Griffin Balanced Stylus Pointer, as the name suggests, is a simple way to get more control over drawing, writing and annotating on an iPad. Since it's passive, it'll work on most touchscreens, doesn't require charging or connecting and even comes with a handy clip so you don't lose it. Griffin is a well-known brand that is able to offer this quality stylus for a silly-cheap price. If you want most of the features of the Apple Pencil but can't justify the expense, the Logitech Crayon is a good alternative – this still offers the tilt sensor and palm recognition of the Pencil. It pairs instantly when turned on and features an anti-roll shape so can be set down easily. You lose the pressure sensing and tap features of the Pencil but then you save a lot of money too. Be aware: this only works the 6th gen iPads. The official Apple Smart Keyboard for 10.5-inch iPad Pro is one of the best ways to turn your iPad into a laptop. You get Apple-quality design and build, which means top-quality keys for typing, as well as a luxurious finish to the case itself. Everything attaches easily thanks to the Apple Smart Connector and the case is thick enough to offer protection but slim enough to stay mobile. While this list is geared towards iPad accessories, if you've got devices from different brands, you'll want to go for a universal keyboard – the Microsoft foldable keyboard is compatible with iPad, iPhone, Android devices, and Windows tablets. Another great feature is its ability to be paired to multiple devices – switching over to the next device is as simple as pushing a button. Plus, with this being a foldable keyboard, it's easier to store when it's not in use, and nice and portable too. Logitech has been in the keyboard game for nearly as long as it has existed, which is just one of the reasons this Logitech Slim Folio Case with Keyboard is sold officially on the Apple Store. Bluetooth LE connectivity, complete iPad protection, dedicated iOS shortcut buttons, a stand mode plus a staggering four year battery life make this a winner at that low price. The Brydge 9.7 is aptly named as it aims to bridge the gap between tablet and laptop. Using its Bluetooth connected keyboard, it offers a MacBook style experience with an iPad. You get a full QWERTY keyboard with dedicated iOS shortcuts, high-grade aluminium build, 3-level backlit keys and a lifetime warranty. The iPad Smart Cover is the original and defining iPad accessory that made tablet cases such a necessity. It not only protects the tablet display with a thin yet strong polyurethane and microfibre build, but it also acts as a stand when folded back. The case also features a magnetic connection to hold to the iPad, which allows for smart awakening and sleep when opened and closed. There are a number of copycat versions available now, too. The Griffin Survivor is a superb way to make sure your iPad stays protected. Yes this isn't the most sleek or attractive case, but then it can go all the places that a pretty case couldn't. This iPad accessory is great for those with children, or anyone leading a hectic life who wants to be able to throw their iPad in and out of bags as they travel around. This is US Department of Defense-level safe too. The MoKo Case for iPad 9.7 is an astonishing balance of super low price and multiple features. This offers the auto wake and sleep magnetic flip case of the official Apple smart cover, but also adds rear side protection with heat dissipating materials to avoid overheating. There is also shock absorption for drops and a screen protector to evade scratches. A superb feature set for the low price. The official Apple AirPods have been designed from scratch to offer the ultimate wireless audio experience with an Apple device. That means a simple tap to connect and then automatic recognition when you pop them in your ears. A tap gets you Siri for voice controls without the need to touch your iPad. You get a 24-hour battery with charges from the case, plus decent audio for music and voice. The Bose QuietComfort 35 ii headphones offer a fantastic way to drown out the world around you with active noise cancellation while giving wireless connectivity and decent battery life. These are ideal for travelling or at home where background noise can affect concentration. Comfort levels are high, meaning they can be worn for a long time without being noticed. The perfect flight companion. If you want to go for more subtle in-earphones but wish to stay wireless and on a budget, these Soundcore Spirit Sports are a great option. These sweat and rain resistant buds offer up to eight hours of listening before they need a charge. That makes them not only useful at home with your iPad but also great to head out the door for a run with your iPhone, getting you even more for that affordable price. The Bose SoundLink Revolve+ is a powerful yet portable Bluetooth speaker that offers 360-degree sound to fill most rooms. This even comes with Siri support allowing for easy voice controls via your connected iPad. The battery should keep going for 16-hours, while the IPX4 rating means splash and dust resistance to set your mind at ease as you enjoy the high-quality sound. Sonos started the multi-room speaker revolution and is still leading the way with quality products like the Sonos One. This enables you to connect using your iPad to control the speaker, or any other Sonos speaker in the home, using AirPlay for super simple access. It also supports Siri voice controls and allows you to use two speakers for stereo sound. For Sony-quality sound on a budget, this Sony SRS XB-10 is a great iPad accessory. This portable and affordable Bluetooth speaker will work with any iPad, and offers decent bass for the size and enough audio punch fill most rooms. The battery life is an impressive 16-hours and with IPX5 water and dust resistance you can take it pretty much anywhere you need to go. Despite the name, the Joby GripTight GorillaPod Stand Pro actually fits lots of different iPad types. Thanks to its malleable legs, it can be manipulated to hold the tablet at varying heights and angles – ideal for watching video or (thanks to side-on tilting) FaceTime chatting. The rubber feet hold the unit in place and you can even wrap it around a chair back or pole, for example, to get it in place where you need. The Logi Base Charging Stand for iPad Pro is a typical Apple style design that uses metallic minimalism at its best. The slither of a stand not only looks good and solid but also uses the Smart Connector for easy attachment and charging of the iPad Pro. The iPad can be placed in portrait or landscape mode for use as a video player, work station or even FaceTime video chat interface. The Anker Portable Multi-Angle Stand works with most iPads as well as a host of smartphones including the iPhone. This stand offers support for portrait and landscape viewing and can be titled to offer the perfect viewing angle. While this is great for videos and FaceTime, you won't have any cable hiding or charging support, but at this price would you expect to?